226 pages | 37 B/W Illus. This book explores the foundations of the current economic crisis. Offering a heterodox approach to interpretation it examines the policies implemented before and during the crisis, and the main institutions that shaped the model of advanced economies, particularly in the last two decades. 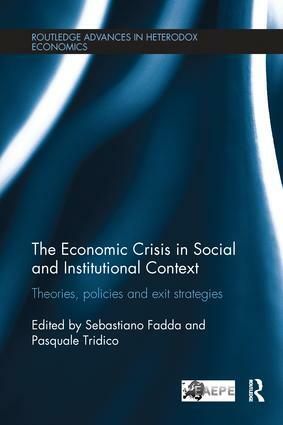 The first part of the book provides a theoretical analysis of the crisis. The roots of the ‘great recession’ are divided into fundamentals with origins in financial liberalisation, financial innovation and income distribution, and complementary or contributory factors such as the international imbalances, the monetary policy,and the role of credit rating agencies. Part II suggests various paths to recovery while emphasising that it will be necessary to develop alternative strategies for sustainable economic recovery and growth. These strategies will require genuine political support and a new 'great European vision' to address major issues concerning the EU such as unemployment, structural regional differences and federalism. Drawing on various schools of thought, this book explains the complexities of the crisis through a wider evolutionary-institutional and heterodox framework. Fadda and Tridico marshal diverse heterodox approaches interpreting the origins of the current European crisis (part I of the book) and discussing exit perspectives and political strategies (part II). Having put these pieces together in a volume, this book is both a forceful critique of (mainstream) economics as a discipline and of European crisis policies over the last years. Sebastiano Fadda is Professor of Economics and Director of the Research Center ASTRIL at the Department of Economics, University Roma Tre, Italy. Pasquale Tridico is Professor of Economic Policy and Jean Monnet Chair at the Department of Economics, University Roma Tre, Italy.